The Canadian Environment in Political Context is an introduction to environmental politics designed to explain and explore how environmental policy is made inside the Canadian political arena. 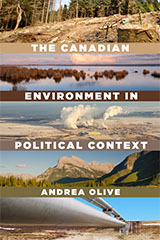 The book begins with a brief synopsis of environmental quality across Canada before moving on to examine political institutions and policymaking, the history of environmentalism in Canada, and crucial issues including wildlife policy, pollution, climate change, Aboriginals and the environment and Canada’s North. The book ends with a discussion of the environmental challenges and opportunities that Canada faces in the twenty-first century. Accessible and comprehensive, The Canadian Environment in Political Context is the ideal text for environmental politics and policy courses.